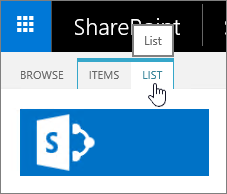 Track and manage information over time with versioning in SharePoint lists and libraries. View and recover previous versions from the item's history. 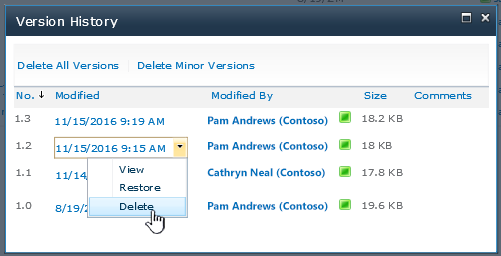 When enabled, new versions are added to an item's history after changes are saved. The number of versions stored and the visibility of draft or minor versions can be modified for each list and library. Click Versioning Settings on the settings page. Require content approval for submitted items. Create a version each time you edit a file in this document library using either major versions only, or major and minor versions. Limit the number of versions and drafts to retain. Set who can see draft items. Require documents to be checked before they can be edited. Create a version each time you edit an item in the list. Set who can see draft items in the list. 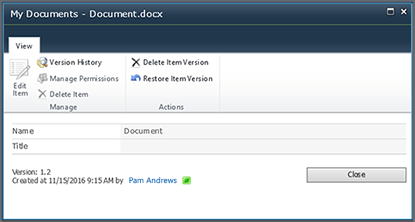 To restore an earlier version of a document, follow these steps. 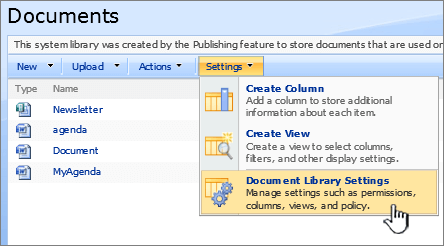 Go to the list or library with the item or document for which you want to view history. Click the ellipses (...) next to the item for which you want to view history. If you don't see Version History, click the more, and then click Version History. 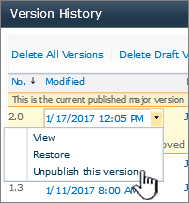 In the Version History dialog box, hover your mouse over the date link on an earlier version and click the down arrow to show the menu. In the menu, you can do the following. View the current document. 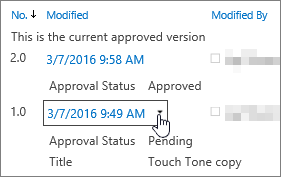 This will bring up a dialog where you can edit, restore, or delete, as well as see the current approval status. Restore the document. 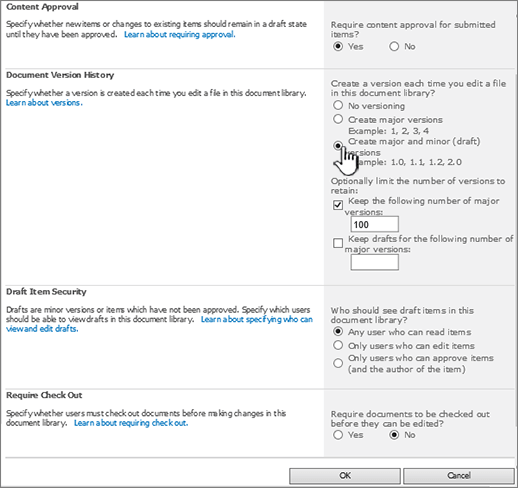 This option displays a dialog asking if you want to make it the currently approved document. It will add it as a new version. Delete the document. This option displays a dialog asking if you're sure you want to send the item to the Recycle Bin. Reject this version. This only shows up on approved documents, rather than Delete. When you're done, click the X in the upper right corner. Click Library or List in the ribbon. Click Library Settings or List Settings in the Settings group. 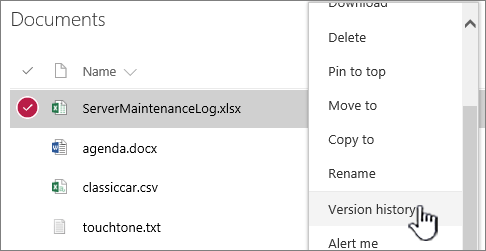 Create a version each time you edit a file in this document library, either major versions only, or major and minor versions. 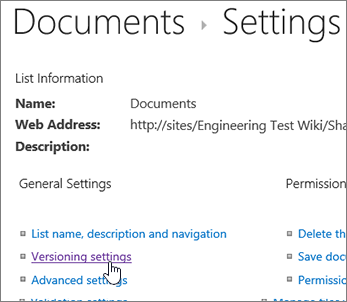 Do the same steps for enabling, but click No versioning on the Version Settings page. You can also check No for Require content approval. In the ribbon click Files or click Items. If there isn't a ribbon, click the ellipses (...) next to the item for which you want to view history. If you don't see Version History, click the ellipses (...) in that dialog, and then click Version History. 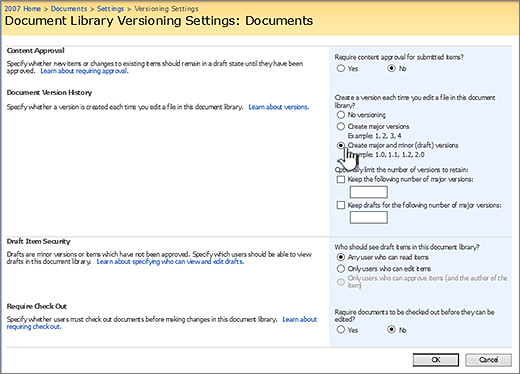 Take the following steps to enable and configure versioning in a list or library. Navigate to the list or library you plan to work in. 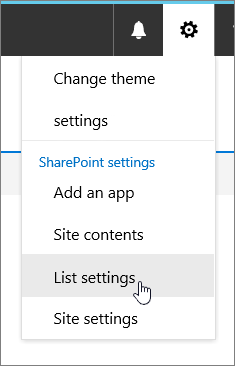 If the name does not appear in the Quick Launch pane, click All Site Content, and then select the name of your list or library. On the ribbon, in the List Tools or Library Tools group, click the List or Library tab. Click List Settings or Library Settings. 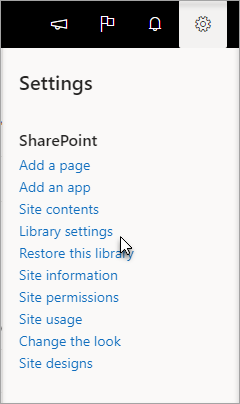 The List or Library Settings page opens. The Versioning Settings dialog box opens. For Document Libraries, in the Item Version History section, under Create a version each time you edit a file in this document library? select either major versions only, or major and minor versions. 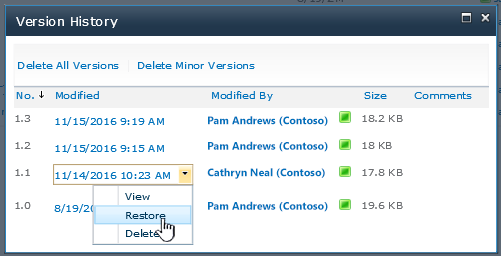 For Lists, in the Item Version History section, under Create a version each time you edit an item in this list? click Yes. Optional: Select the number of versions you want to retain in the list. 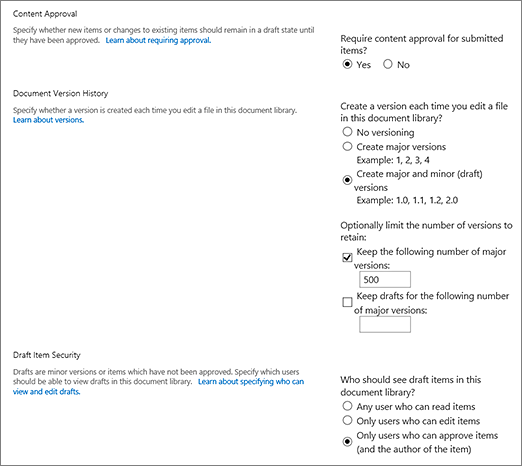 Optional: For lists, select the number of approved versions for which you want to retain drafts. This option is available when you select Yes in the Content Approval section. 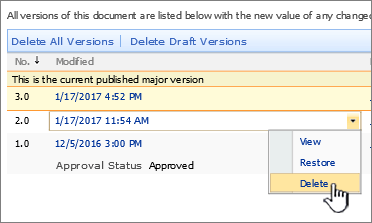 For libraries, set a number under Keep drafts for the following number of major versions. Any user who can read items. This selection allows access to anyone who has Read permissions to the site. Only users who can edit items. This selection restricts the view of drafts to those who have permissions to edit. Only users who can approve items (and the author of the item). This selection restricts the view to only the original author of the item and those who have permissions to approve items in the list. Click OK to close the dialog box and return to the Settings page. For Document Libraries, in the Item Version History section, under Create a version each time you edit a file in this document library? select No versioning. 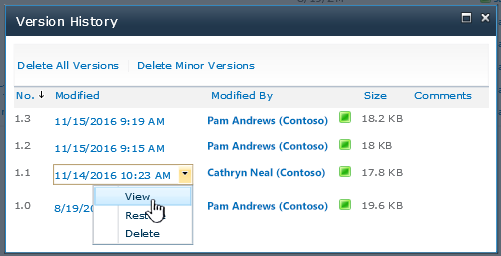 For Lists, in the Item Version History section, under Create a version each time you edit an item in this list? click No. 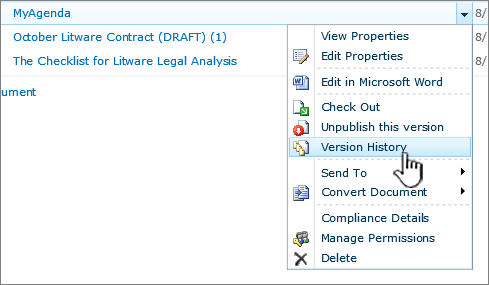 click the down arrow next to the document or item you want to view version history, and then click Version History. From the View dialog, you may be able to edit, though it's usually disabled. To edit, select Edit Properties from the drop-down menu on the file or item. 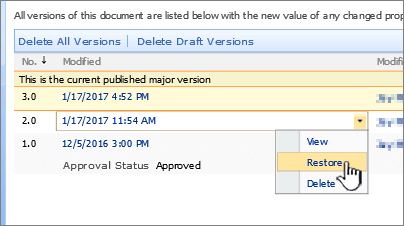 Unpublish this version shows when you are using approval and publishing on your documents or items. When you're done, click the X in the upper right corner if the version dialog hasn't closed already. Click Settings , and then click List Settings or Document Library Settings. To specify the number of major versions of document files that are stored, select the Keep the following number of major versions check box, and then type the number of major versions that you want to keep. 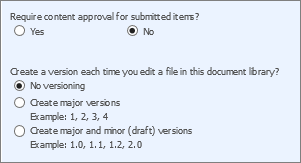 To specify the number of minor document versions to keep, select the Keep drafts for the following number of major versions check box, and then type of the number of major versions that you want to keep drafts (minor versions) for. Follow the steps for enabling versioning, but in the Versioning settings dialog, click No versioning. 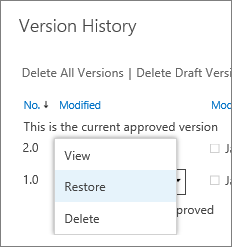 From the View dialog, you delete or restore the item, or return to the version history. You can configure other settings that affect versioning. In lists or libraries, you can require content to be approved. In libraries, you can require files to be checked out. For info on these settings and more, see How does versioning work in a list or library?